Exoplanets - planets around stars other than the sun - were discovered almost 20 years ago,but for the first time, X-ray observations have detected an exoplanet passing in front of its parent star. An advantageous alignment of a planet and its parent star in the system HD 189733, 63 light-years from Earth, has enabled NASA's Chandra X-ray Observatory and the European Space Agency's XMM Newton Observatory to observe a dip in X-ray intensity as the planet transited the star. HD 189733b is a hot Jupiter, meaning it is similar in size to Jupiter in our solar system but in very close orbit around its star. 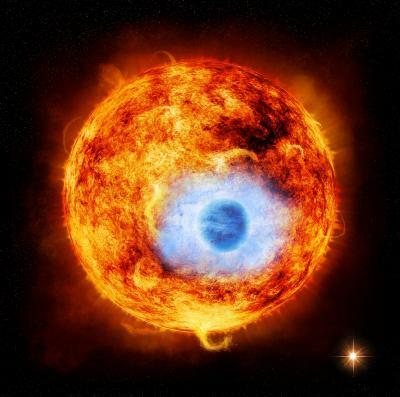 HD 189733b is more than 30 times closer to its star than Earth is to the sun. It orbits the star once every 2.2 days. HD 189733b is the closest hot Jupiter to Earth, which makes it a prime target for astronomers who want to learn more about this type of exoplanet and the atmosphere around it. They have used NASA's Kepler space telescope to study it at optical wavelengths, and NASA's Hubble Space Telescope to confirm it is blue in color as a result of the preferential scattering of blue light by silicate particles in its atmosphere.